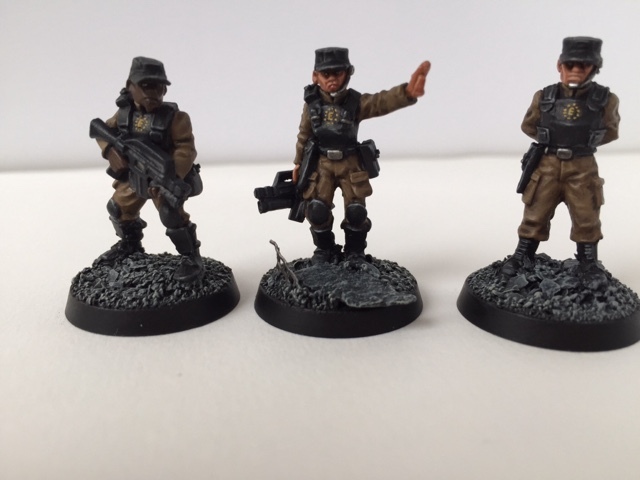 Having completed my Enclave Power Armoured Troops last week I quickly decided that they needed some officers to lead them into the Wasteland. For those who have played Fallout 3 you will be aware that officers in the Enclave strangely forgo the considerable protection provided by the advanced power armour that their troops wear, and instead march to war clad only in baseball caps and military fatigues! Hmmm....this canvas suit and baseball cap definitely look far more protective than full power armour. Unfortunately Brother-Vinni doesn't currently make any sculpts for the Enclave's glorious leaders and so I have been forced to scour the internet for comparable models to adapt to my needs. Luckily after an extensive search I found some suitable 28mm substitutes from Copplestone Castings. Three Enclave Officers ready for battle, the two models with rifles will represent mere Lieutenants whilst the stern looking individual on the right looks more like a senior Captain or Major to me. Having GM'd/hosted the Rogue Trader vs Fallout game at this year's BOYL and had such a thoroughly good time with all involved I have been motivated to paint up some more post-apocalyptic models for combat in the Wasteland. This has been further spurred on by the news that Fallout 4 will be arriving on our consoles/PC's in November and my growing addiction to the Fallout: Shelter App on my mobile phone! I completed a full squad of Brotherhood of Steel Paladins, Heavy Weapons Troopers, and a Scribe this time last year. So this time I felt the urge to churn out some opposition for the Brotherhood in the form of the Enclave! 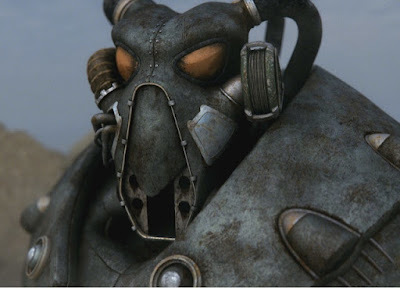 The Enclave are probably my favourite bad guys ever, they are mean, tough and just look badass. I remember playing through Fallout 1 back in 1997 and thinking how cool the Brotherhood were with their power armour and advanced technology which allowed them to dominate the Wasteland. I was pretty shocked a year later when I got to the closing stages of Fallout 2 and encountered the Enclave, soldiers from the US Government who had better armour, better weapons and some sort of cohesive organisation...oh and Vertibirds...VERTIBIRDS!! So after all the fun that was had on the Saturday of Oldhammer Weekend my gorgeous girlfriend decided to give me the complete Wargames experience and take me to Warhammer World for the Sunday. This meant that I could play a game of 40K with her on GWs professionally finished tables, partake of a huuuge burger in Bugman's Bar and also explore their new facility including the impressive Warhammer Museum and Forge World Shop! 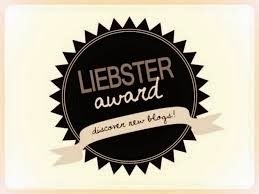 Wow....this was so amazing that I am going to have to cover it in multiple posts; so please bear with me! 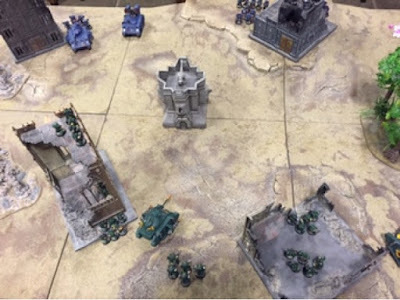 We were given a very impressive looking six foot by four foot table in the middle of the gaming hall with a variety of scatter terrain that I laid it out to represent a small deserted outpost with a bunker in the middle. This bunker would form the objective for each player (essentially TAKE AND HOLD) and would need to be seized and dominated in order to ensure victory. The implementation of this basic mission allowed us to jump into things pretty quickly which was vital as we had only been allocated a three hour slot which I didn't want to waste shuffling cards in order to work out missions, etc. Well BOYL/Oldhammer Day has been and gone for another year and what a fantastic event it was for everybody who took part. Honestly the come-down from this event is starting to feel like that empty week that follows the Christmas period when you realise that the festivities are over for another 365 days. Oh well...at least I have loads of great gaming memories (and far too many new models) to remind me of the fun that was had. Further thanks must go to the Ansell's and Weazil (Gaj) from the Oldhammer forum who sorted me out a nice room with an excellent 7 x 7 table to facilitate the game (I presently decorated this with Nuka Cola posters and Mentat boxes to set the theme of the universe). 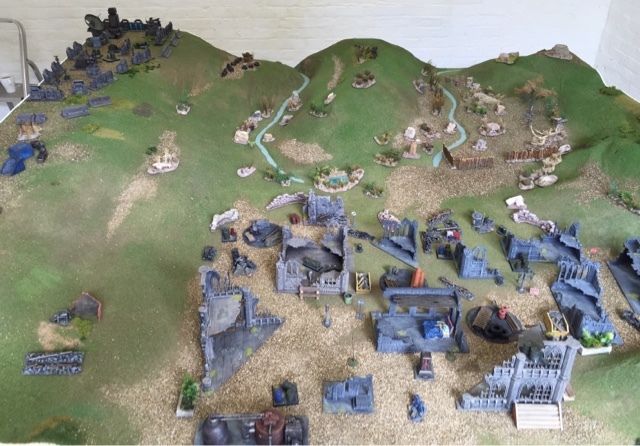 I also need to express my gratitude to my participants who really pulled out the stops and brought additional post apocalyptic scenery to augment my own, this was really useful and helped further immerse the players in the Fallout-esque setting.